Video Analytics have much to offer homes and businesses. Contact Vuetek Systems 01772 883788 info@vuetek.com or fill out the form below to send us a message to find out more. Accurately detect human faces in a surveillance scene, analyze features and trigger an alarm. Can be combined with smart searches. This function can be used for detecting people, vehicles and objects crossing a set virtual line. The line crossing direction can be set as bidirectional, from left to right or from right to left. Ideal solution for monitoring entrances, car parks and limited access areas. Intrusion detection function detects people, vehicle or other objects which enter and loiter in a pre-defined virtual region. Applying the latest algorithms, it can automatically analyse the intruder’s dimension ratio to reduce false alarms. On-board ANPR analytics allow the ability to detect and recognize a vehicle’s license plate and send ANPR info to an NVR for access management, alerts or recording purposes. 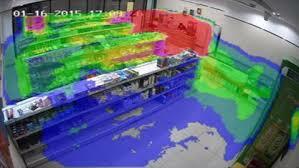 Heat map analysis offers a visualization of the footfall within the camera’s field of view. This is ideal for business intelligence and operational efficiency applications, particularly for the retail market. Users can make operational decisions based on the locations of the highest and lowest traffic areas within their store.